Email marketing can be a very effective sales tool. However, it sometimes gets a bad reputation, because those using it don’t understand the correct way to make use of it. Like any marketing tool, it can be used correctly for great success, or poorly and destined for failure. Listed below are some common email marketing mistakes that are often made. These can really destroy any benefit from using the email marketing strategy. One of the most common email marketing mistakes made by those implementing an email marketing campaign is to not think about your recipient’s time. There’s a good and bad time to send emails. And realistically there are a lot more bad times than good. There are many webinars and helpful tools online to help you determine when would be the right time for the kind of message you are going to send. It matters because if the message shows up at the wrong time it is much more likely to simply be deleted without ever being opened. If you want to effectively send emails to your lead, you need to take advantage of an Email Service Provider. Why? Because they will ensure that all of your emails are clean, CAN-SPAM compliant and ready to be sent out. These days there are just so many ways that your email message can be marked as spam. It might look fine to you but still are picked up as spam, which is why you need to be using an Email Service Provider so that you can ensure you get the assurance that your emails are actually reaching their destination and that your subscribers are reading them. Images can really add to your email content when done correctly, but the trouble is they are seldom used correctly. Two common email marketing mistakes include using too many images and using images that are too big. Remember that a large number of your recipients are going to receiving their email on their mobile devices and if the images are too big they’ll be very slow to load and you will frustrate your recipient. Too many images can lead to loss of your message. So what you want to do is use one or two images that have been shrunk in size and that help grab the reader’s attention to your message. 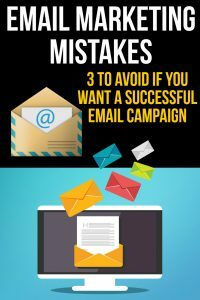 Avoid these three common email marketing mistakes and you will be on your way to a successful email marketing campaign.